I have been meaning to publish an article for a few years now on how meta-paradigmatic conjunctions occur. It appears that, over time, disciplines eventually develop schools of thought that become a conjunction of nine aspects. These aspects coincide with the viewpoints from the nine essential divisions of human consciousness. If you think about it, this would be a logical emergence, as peer community responses to the initial thought leaders will begin to balance perspectival biases where there is a natural diversity of type. While this process takes time, it has a clear destination. In having a mix of views we eventually see the whole undistorted by the vision of the first to see. When this occurs this is a really healthy indicator of the strength and openess of the knowledge community and its engagement. 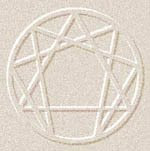 A.H. Almaas in Facets of Unity: The Enneagram of Holy Ideas sets out the nine facets by which we distort reality, with a minimum of psychological pretension. Drawing directly on the work of Chilean psychiatrist, Claudio Naranjo, the spiritual teacher Oscar Ichazo and relating the work to the concepts of Grudjieff's Fourth Way practice, this is an excellent source work on the essence of these Nine aspects. From this base, profoundly insightful descriptions using the Enneagram as a guiding model have resulted. The many other Enneatype characterologies subsequently generated are then only as valid as is the extent of the capability of our human personality to confuse the projection of reality with our own constructions. Awareness of these distinctions is profoundly useful to the meta-paradigmatic practitioner. The Nine Facets have been identified in theoretical convergences within the maturing fields of organisational development, systems theory, strategic management, futures studies, apithology and integral theory. Gradually over time all nine appear and the tenth is found in their convergence. So it was a surprise the other day to see at a Dialogue for Community Climate Change Action the nine faces of Climate Change already appearing. These are an extension and refinement of the already identified existing typology of frames from the science debate as it now moves to the problem of humanity's unified response to this global concern (Nisbet, 2009). "From good data we will gain a good picture." "All actions, even small ones, can help." "Symbolic acts of leadership will show the way." "To listen to the earth is to find our guidance." "Survival is found in our adaptive response." "Respond now before we cannot." "There is no one silver bullet solution." "Push back and push on." "For our kids' kids, act in peace." Our new game in the serious task of watching the evolution of consciousness is to spot when a field reaches this level of maturity, being seen when the conjunction of the parts reveal themselves as one undivided whole organized around human perceptions. When you do see this - shout 'Enneatype Bingo!' to win our prize. The prize is - the wisdom perspective from the undifferentiated consciousness of the collective of human compassion acting with engaged concern.